Turn on the news lately, and it’s like The Shawshank Redemption has broken the fourth wall. Sure, there haven’t been any heartwarming relationships cemented or beachside dreams achieved (yet), but between daring escapes by a couple of cold-blooded felons in Upstate New York and a notorious drug lord in Mexico, the prison break is back in the limelight. And in following coverage of both events, I couldn’t help but think that, for supposedly “maximum” security prisons, these breakouts just sounded so easy. It was a fine coincidence, then, that these transgressions occurred right around the time of the first release in Dynamic Discs’ new line of “easy-to-throw” molds. The Breakout, according to the Emporia, Kansas manufacturer, is a “slightly understable fairway driver…that you need when you have to have a bit more distance but you can’t sacrifice accuracy.” With flight numbers clocking in at Speed 8/Glide 5/ Turn -1/Fade 1.5, the Breakout is only available in weights between 150 and 159 grams. Currently available in Dynamic’s Lucid (premium translucent) plastic, the Breakout features a sharp rim that yields plenty of speed for a driver situated in the fairway category. A mild scoop to the lower wing provides the mild turn and fade that makes a disc plenty workable out of the box. Lightweight drivers, though, can always be tricky. Whether it is due to an adjustment in timing or enhanced susceptibility to the wind, 150-class discs generally take me a bit of time to warm up to. The Breakout was no different, as I struggled to control the nose angle in my early throws with the mold. On some tosses, I would pitch it too far down, ending in a short throw into the ground not far off the tee box. On others, what I thought was a normal throw would take a nose up ride into the clouds, climbing high before stalling out. This omnipresent nose angle sensitivity reminded me a lot of my early disc golf days and throwing the Latitude 64 River, a disc that is packed with glide but only rewards a smooth, controlled release. So, I slowed down my run-up, concentrated on my form, and worked on throwing the Breakout nice and easy. This small adjustment yielded massive results, as I soon found the Breakout to be capable of hitting nearly every line I needed off the tee. And the best part of it was that, because I was slowing everything down, I was actually achieving these shots with less effort than needed to throw my usual drivers. Thrown flat, the Breakout will ride a long, straight line before fading out at the end of its flight. It’s a pretty standard route, but the aforementioned lack of effort makes it easy to execute at about 60% power. This comes in handy in situations when a teepad might be slick and you’re unsure of your footing, or when a standstill throw is required. Where this disc really stands out, though, is with subtle changes to your angle of release. Given a mild hyzer release, the Breakout will hold a nice, smooth line without flipping up to flat too easily. With its pronounced glide, though, it can run those mellow c-shaped flights for long distances, as evidenced by landing pin high on a 330-foot hole this week. I (shockingly) canned the 35-foot putt for what I believe is my first birdie on said hole. A mini anhyzer angle, though, is the Breakout’s bread and butter. Two recent shots at Brengle Terrace Park in Vista, California drove the point home. The long position on Hole 3 at this course is unmeasured, as it was installed after the original course map was published. I am guessing it is slightly shorter than 300 feet, but it has a gradual rise off the tee that flattens out as you reach the basket, making it play slightly longer. Giving the Breakout a hair of anhyzer, it shot out of my hand and held a long, gradual turn, disappearing from sight. When I approached the basket to find my shot, it was long by about 20 feet. The Dynamic Discs Breakout is most comfortable when sitting pin high. As a noodle arm, I’m always OK with overthrowing a hole. It’s a good problem to have. Hole 7, when in the short position, is measured at 324 feet long, but again plays uphill. Using the same anhyzer – which, truth be told, is a bit risky on this hole due to a headwind that sometimes plays off the top of the incline – the Breakout again held that long, gradual turn, this time for about 90% of its flight before flexing forward for the final portion of its voyage. After trudging up the hill to find my lie, I was shocked to see that it was pin high. I have never thrown pin high on that hole. And I can’t reiterate enough how little effort all of these shots took. Like Julius Thomas scoring in the red zone or Sugar Ray cranking out guilty pleasure chart toppers, they were just so easy. While I highly recommend the Breakout for noodle arms and power players alike, I understand that some readers might be concerned about this disc’s place in the Dynamic Discs lineup. After all, at Speed 8 it shares a similar flight as the Thief (in my experience, the Thief does not hold up to it’s 0/2 turn and fade numbers, running closer to -1/2), and its turn and fade numbers leave it awfully close to the Speed 9 Escape, too. Factor in the Escape’s availability in Dynamic’s lightweight Lucid Air plastic, and it seems like the fairway house might be a little crowded. There are some important differences in each disc, though, that allow them to coexist. First is the plastic. Personally, I am not a fan of Lucid Air plastic. For me, it feels more slick than the standard Lucid, making it a bit more unpleasant to grip. The run of Lucid that the Breakout is currently run in, on the other hand, has so much tack your thumb almost squeaks when you run it across the flight plate. It’s a noticeable difference, and one that, for me, gives the nod to the Breakout. Compared to the Thief, then, the Breakout wins on effort. I’ve been battling a recurring oblique injury the past couple months, and when it flares up I am a bit more timid off the tee. Instead of engaging my core, I end up using more arm in my throw, adding even more figurative carbohydrates to my already noodly style. When I have tried to throw the Thief throughout this injury, I end up not following through well enough to see its full path, leaving it flying more overstable than it should. With the Breakout, though, I can get away with more arm and play through the injury, still seeing the Thief-like flight out of its lightweight brother. There is much less stress on the body with a disc like the Breakout, which I feel like is an often understated, yet hugely important factor in throwing 150-class discs. It’s an excellent weight to have in the bag for those first couple throws when you’re not quite warmed up yet, or even at the end of a round when fatigue has set in and you’re firing on fewer than all cylinders. At that point, ease of use trumps pride, even if it means putting your max weight discs on the bench in favor of the featherweights. There’s no shame in throwing a light disc like the Breakout, though, when it goes this far. And when you end up closer to the basket, the weight of your driver won’t be the only thing on the course with a low number. Your scorecard will have one, too. 1) LIKE Noodle Arm Disc Golf. 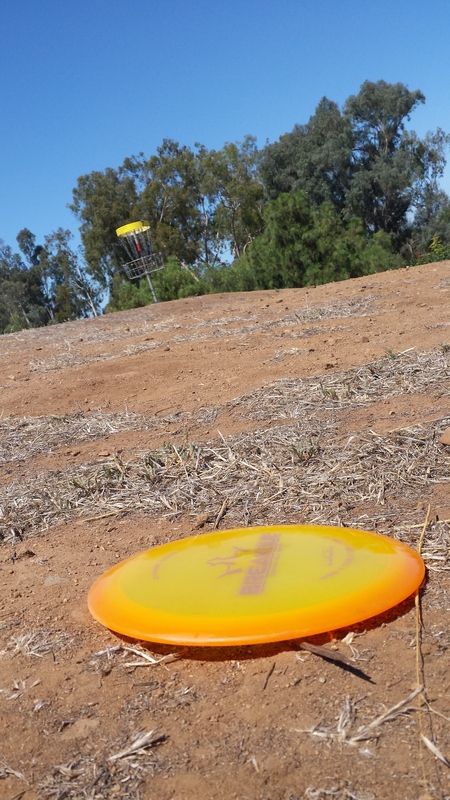 3) LIKE and COMMENT on the pinned post for this review at the Noodle Arm Disc Golf page. Your comment has to include your favorite guilty pleasure band or musician, that one artist that you’d never admit you like, but you definitely aren’t changing the station when it comes on the radio. No guilty pleasure in the comments, no dice. The contest will run until Thursday, July 30 at 9 p.m. PDT, when two random winners will be chosen. Thanks to Dynamic Discs for providing the plastic! Sadly….Madonna… Borderline gets me everytime..
@ Jawnny, I was so hoping you were gonna say Shatner’s “Rocket Man”!!!! LoL, it’s STILL epic! !